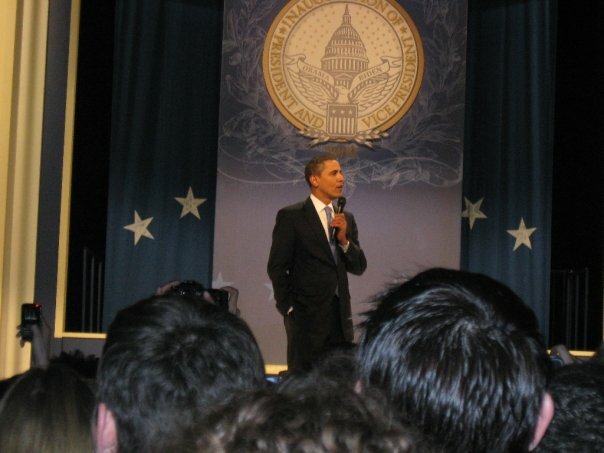 Here it is, a bit overdue, Kristin's 2009 Presidential Inauguration Report. At this moment, I survey my self and find I am still tired , still happy, relieved, elated, inspired and a bit disoriented ... for after a week like that, what do you next?! My friends from the New Mexico campaign (a mix of staff and volunteers) started showing up Thursday before the Big Day. I felt privileged to show them my funky neighborhood including the ethnic restaurants and unabashed diveswith great hip-hop DJ's. We did the "We are One" concert on the Mall on Sunday (where at one point, the crowd got so tight that I felt in danger of literally becoming one with several strangers). The HBO/Inauguration Committee botch of the Gene Robinson opening prayer put me in a tizzy but didn't overshadow the exuberance of the moment. An early afternoon party around the corner from my place (networking for those staffers moving to DC) was quickly followed by my own party later that evening (I love it when friends apply me with their wines and their playlists). Monday was a bit of a rest (okay, recovery) before the next day's early morning wake up call. We did make a mad dash for Dupont Circle at 6 pm where Kate Clinton was holding a Sage-Out, administering the Lesbian Power of crystals and herbs to rid our town of the bad ju ju accumulated over the past 8 years. For me (who takes this stuff not seriously), I found it so fun and the closing song surprisingly touching. We greeted the next day, Inauguration Day, with a mixture of excitement and battle-readiness (but, like, a kind battle where you have no enemies, keep each other warm and help everyone win). Alas, our group of 10 fell pray to the PIC planners' missteps and miscalculations. After we endured the 6-hour, purple ticket holders' tunnel to nowhere, we were ultimately fragmented by the push of the remarkably friendly but still pressing crowd. With three from the fellowship remaining (apologies for the nerdy reference), I made it through the purple gates of hell only as Obama was being sworn in. So it was with a tinge of frustration and regret that I witnessed The Moment and The Speech apart from our full group, nowhere near our ticketed area, on an tree-obscured Jumbotron and over distant and muffled loudspeakers. Worry not for Diane Feinstein says she'll make it up to me and my friends with a collection of limited edition as-seen-on-TV Barack Obama commemorative "Victory" plates (or something like that). Yet we all quickly recovered, heartened by our collective experience as still part of something awesome. Later that night, I happily passed on my ticket to the Youth Ball (for I may be "young at heart" and some would say "immature" but there were many more deserving and qualified for the position than I) and instead joined local friends at Station 9 where we danced-danced-danced. Bonus Round: Wednesday night removed any last trace of I-Day regret with the Staff Ball at the DC Armory in SE. Both the Obama's and the Biden's addressed the crowd and were jovial and remarkably lose. I generally hate name dropping but I must say it was incredibly cool to hear from David Plouffe (that guy who stalked you with emails throughout the campaign he orchestrated and refused all press interviews). By Thursday evenings all of my dear compadres were gone and my household was back to Corky and me. But no stopping just yet as I took off Friday afternoon for a weekend Buddhist retreat in Maryland. Although initially resisting the timing, I promptly took up the opportunity to go deep into silence like a warm shawl. 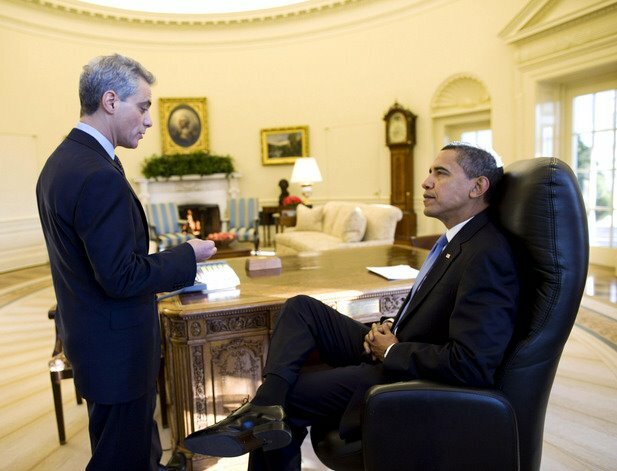 I have to add that one of my favorite moments was picking up Wednesday's Post and seeing this on the front page: Rob Emanuel in the Oval Office facing an Obama who was, relaxed and listening, seated behind that historical desk!!! I was deeply struck by it's normalcy. This is our President. He's already ticked me off and at least confused me a few times and I expect that. But to trust the intentions, intellect and temperament of my President is not only a welcome change but a beautiful thing in its own right.